Only one third of small business owners were able to obtain all of the credit that their businesses need, a recent National Federation of Independent Business (NFIB) survey shows. The survey’s finding is not surprising. Many economists, policy makers and small business advocacy groups have long explained that small businesses have a harder time obtaining credit than their larger counterparts. When it comes to accessing capital, size definitely matters. 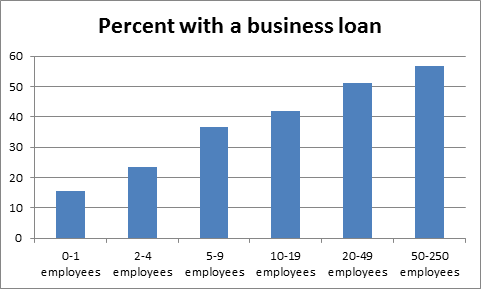 Even among small businesses, the smaller the company, the lower the odds that it has a loan (see figure below) or a line of credit. Only 15.7 percent of businesses with one or fewer employees have a business loan and only 33.7 percent have a line of credit, the NFIB survey shows. By contrast, 56.8 percent of businesses with between 50 and 250 workers has a business loan and 65.4 percent has a line of credit. Rather than reveal some sinister motives among bankers, however, these patterns simply reflect the economics of business credit. Fewer small businesses have access to credit than larger companies because lending to them is riskier and more expensive than extending credit to larger companies.